Keith and I began the year living in a rented house with my ex-husband, Michael, and our two dogs: Ella and Lilly. Lilly was brand new to us, as she had been my son's for just a few weeks before he realized his allergies to dogs were making him too miserable to keep her. 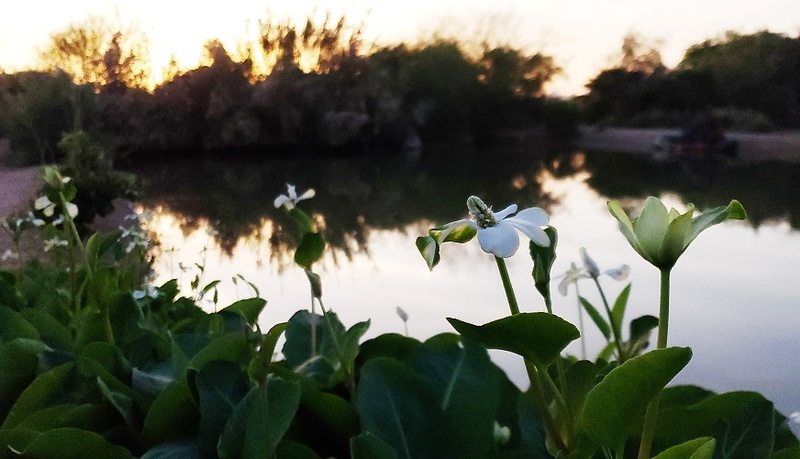 In January we went on two hikes: To Blevins Trail at Usery Mountain State Park, and to the Lost Dutchman State Park, both of which are in the Greater Phoenix Area. We were accompanied on the Blevins hike by Keith's twin brother, Chris. 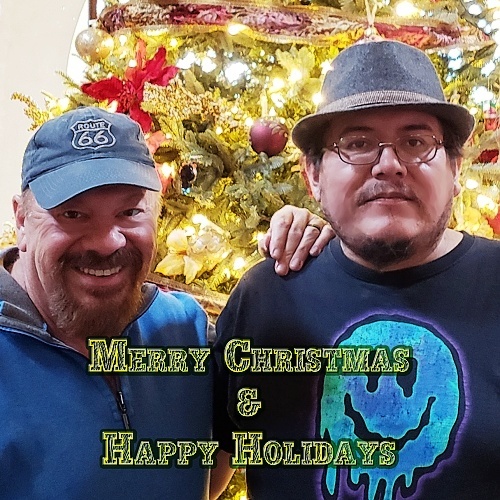 We also got to make a couple visits to see my grandbabies in Chandler, which gave me a chance to practice my new photo-to-art technique. 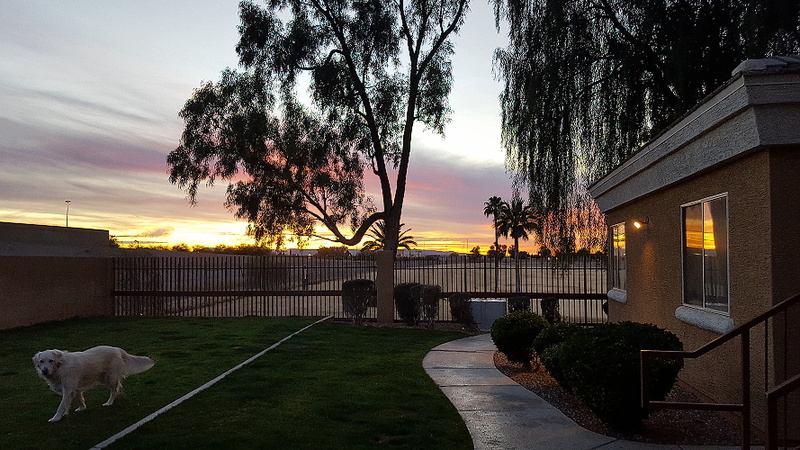 At the beginning of February, Michael and Keith and I and the dogs moved from the rental house to an apartment at Indigo Springs in Mesa. 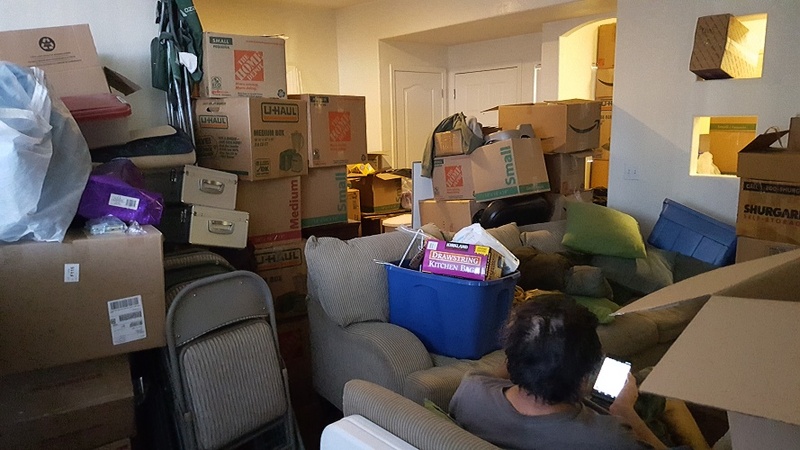 Since Keith and I had lived in a condo previously, we had a lot of stuff to move, most of which ended up in two storage units. But the grounds are pretty, there's a handy place to walk the dogs, and we get gorgeous sunsets every night over adjacent Sherwood Park. Also in February Keith and I made our first visit to Saguaro National Park, near Tucson. 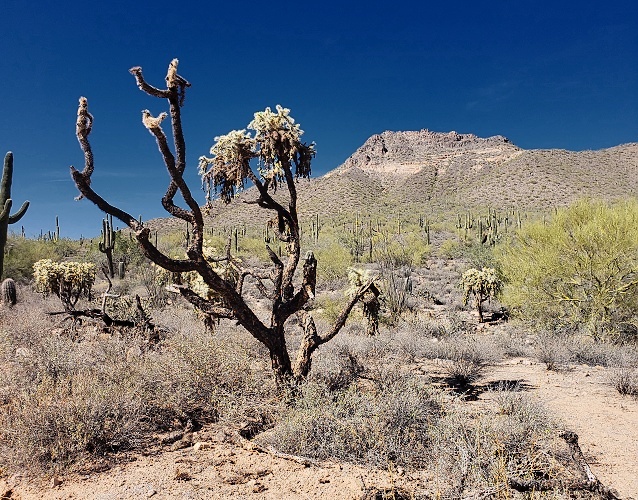 The sights were astounding, of course; and the saguaros were profusive, many festooned with fantastic arms. 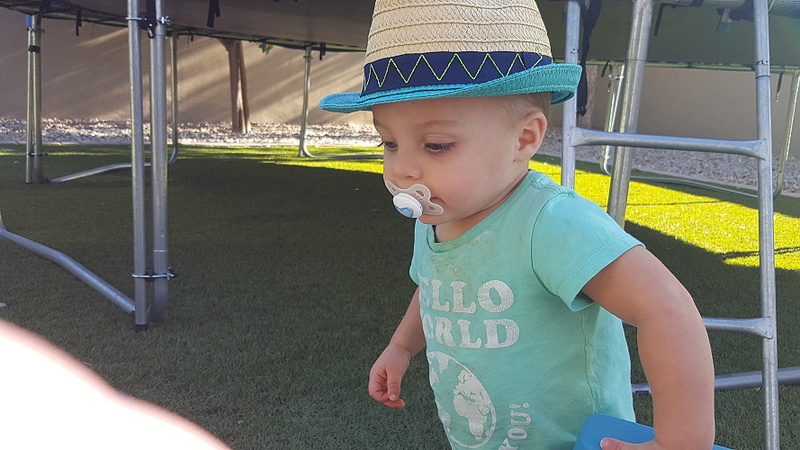 This was also the month my grandson, Dominic, discovered hats. My oldest grandchild, Zach, has been going to college in Manhattan. But he occasionally makes trips home, as he did in March, where we can treat him to lunch. This visit included my son, John, and Michael, as well. 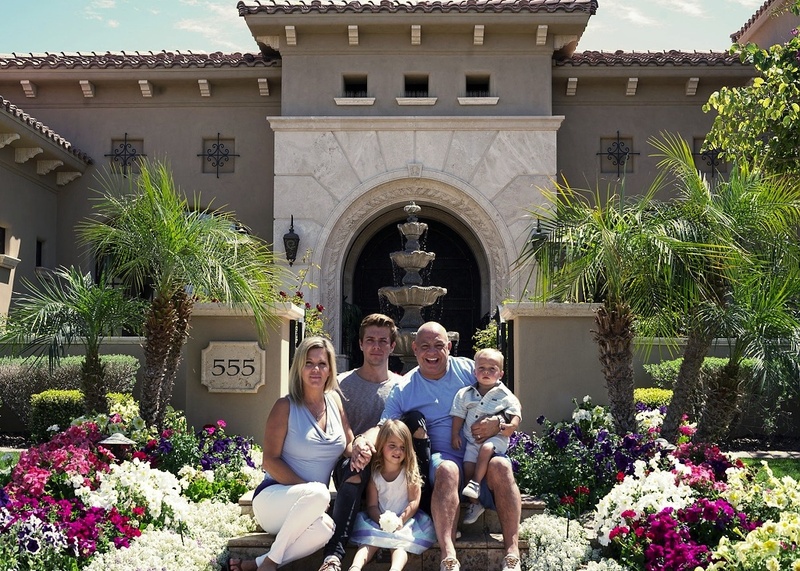 By March we had settled into a routine; on Sundays we drove to visit my daughter, Jenny, and her babies at their home in Chandler. I also got pretty good at making these easy hikes (for example, at Dreamy Draw) by myself when Keith slept in after an all-night gaming session. In March I upgraded my phone for a Samsung Galaxy 9+. The best part of it is the built-in camera, which is so sensitive I can even get good night photos without additional lights or special setup! Sherwood Park, adjacent to our apartment complex, isn't really a dog park but it's so big and uncrowded that we can often let the doggies run loose there. When we do, all they want to do is play rough-and-tumble. ...and for the remaining Sundays, with Jenny's husband, Jimmy, often barbequing for the occasion. In addition, we made our first trip of the year to the hot spring in Tonopah. We also got to see an excellent concert by the North Valley Chorale, with whom our friends Barbara and Peter perform. 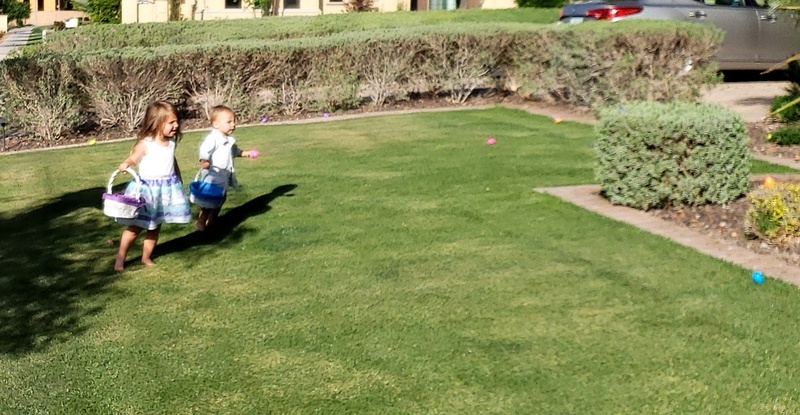 A special treat in May was when Keith and I spent the night at a Sedona resort with Jenny and the kids. The resort, L'Auberge, was right on the bank of Oak Creek, and was almost more like camping than a hotel, because of the small cabins and profuse greenery. Also in May, we discovered another dog park—this one with a lake! Lilly was nervous about swimming at first, but Ella charged right in and Lilly soon was splashing right with her! Zach's birthday falls on the 22nd, so on the 21st he flew home from New York and we celebrated. Zach's baby siblings missed him so much! In June we found ourselves travelling. 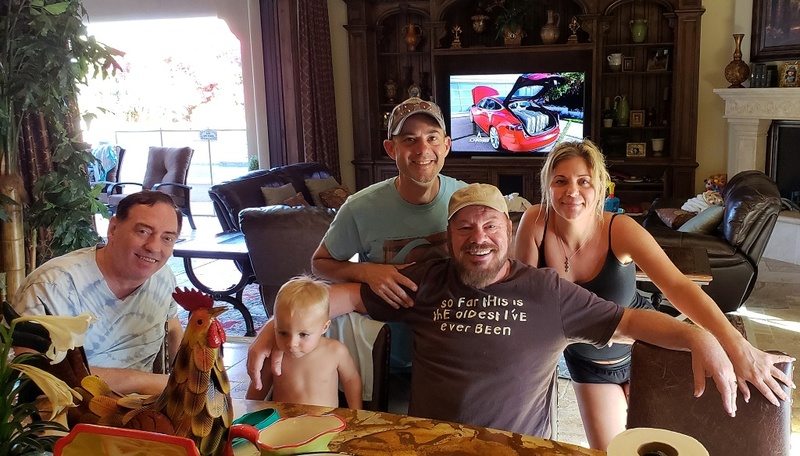 First, we made a trip to Kirtland, New Mexico, to visit Keith's family, including his little niece Elizabeth, who is Gianna's age. 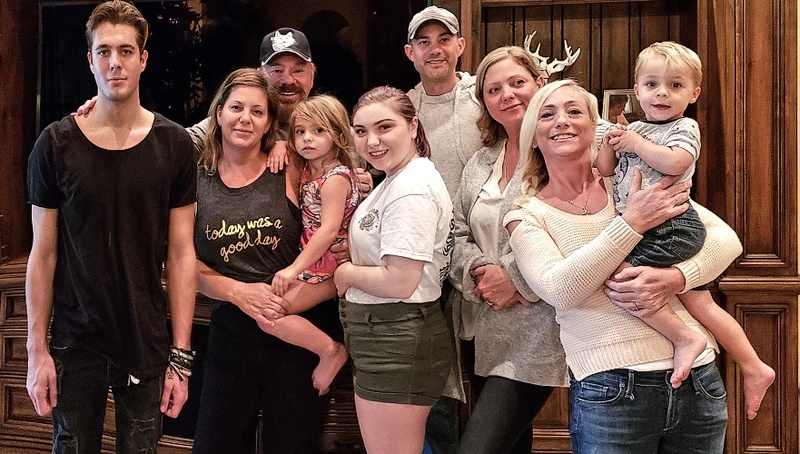 But the big trip was to Malibu, where Jenny had rented a beach house and invited us to join her and the babies and Zach and John there. We did something every day, whether it was hiking alone or with the kids. As the Valley heated up for the hottest July on record, Keith and I began looking to spend more time with the dogs where they could swim. 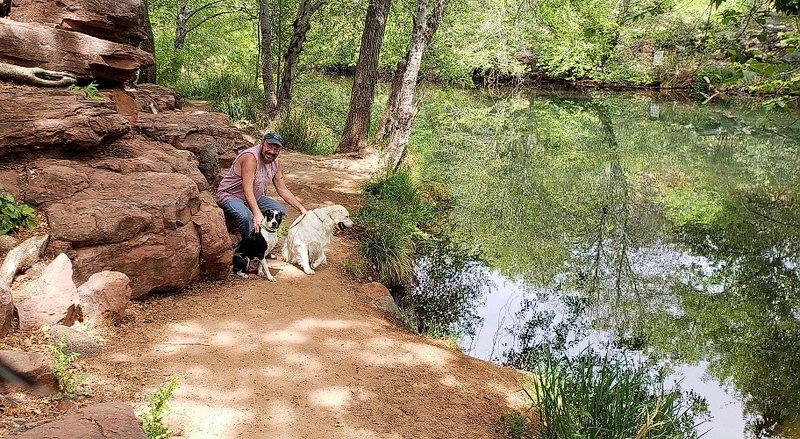 That included in the Salt River at Pebble Beach, as well as Cosmo Dog Park and even Jenny's pool. We also joined Jenny for a visit to Butterfly Wonderland. August's trip was a short one to Bell Rock in Sedona, with Jenny and the babies, John, and Jimmy and his nieces who were visiting from New Jersey. For whatever reason, we have always had a lot of September birthdays among the family and even close friends. We used to have just one giant birthday party for everyone. 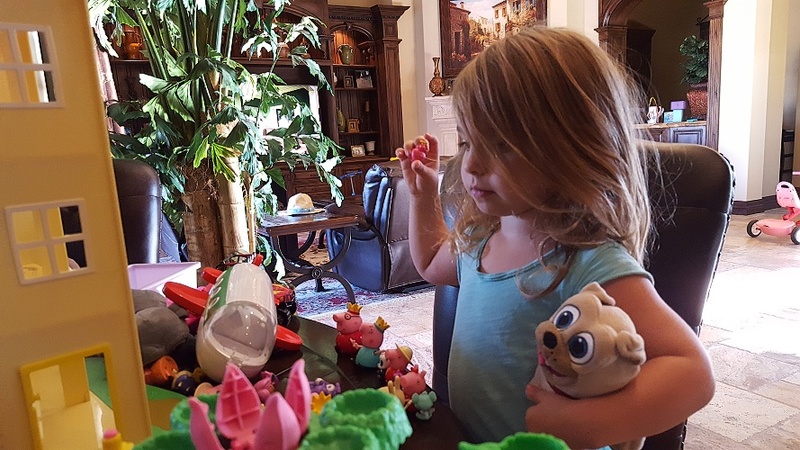 But now, two of the birthdays are those of my toddler grandchildren; and, of course, each one needs a party of their own. 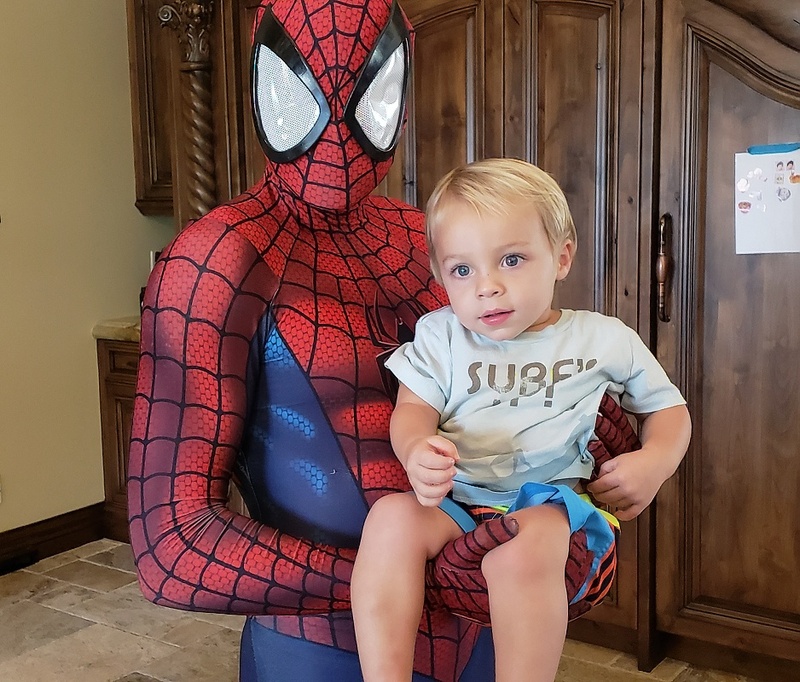 The special guest at Dominic's 2nd birthday party was none other than Spider-Man! And the special guests for Gianna's 4th birthday a week later, were not one, but three Disney princesses! 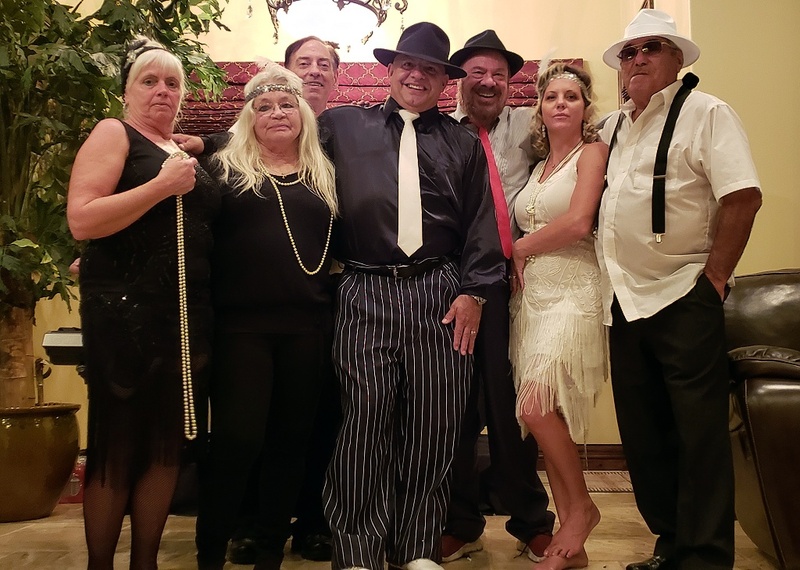 And a week after that, my son-in-law Jimmy was given a surprise party for his fiftieth birthday, with a 1920s theme. 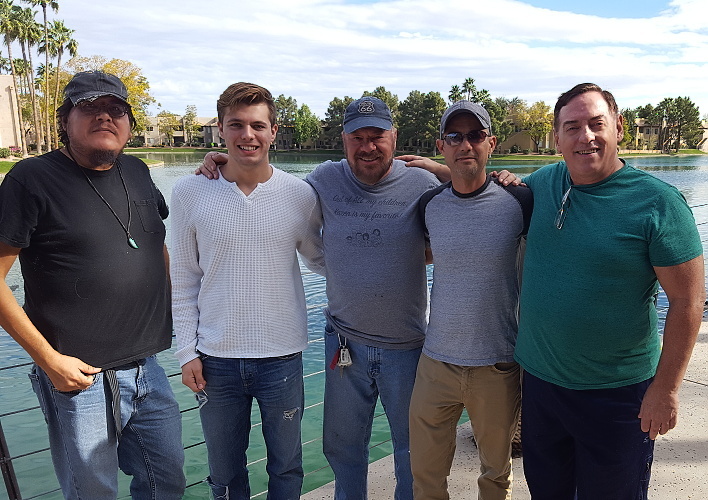 In addition to celebrating birthdays, in September we received a visit from Michael's ex, David, and David's husband, Nick. 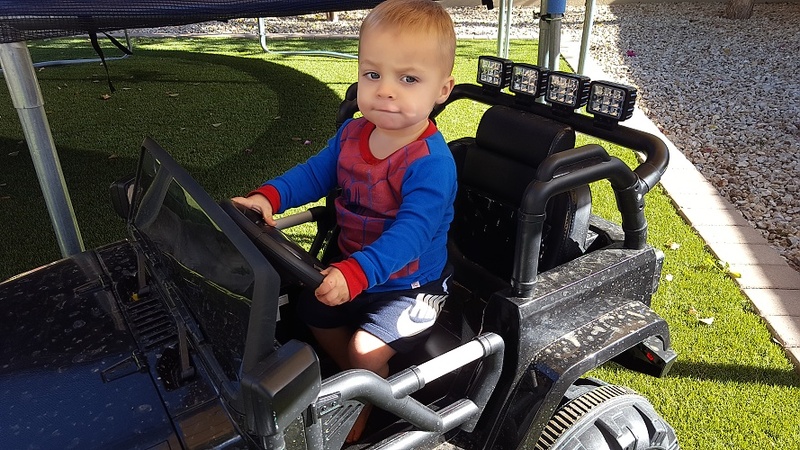 We took them to see the Desert Botanical Gardens. We also got to have non-birthday visits with the grandbabies, who were getting very good with the trampoline! In October, we had a visit from Michael's nephew, Allan, and two of Allan's friends, all from Denmark. Because I love to show off Arizona to anyone who will allow me, we took the Danes to the Superstition Mountains, Sedona, and Grand Canyon. Iben, Jacob and Allan from Denmark. Later that month, my eldest, Dorothy, and her daughter, Cailey, came out for a visit that looks like it's going to become permanent. She got a job pretty quickly, but first we took them to Montezuma's Castle. The most exciting thing in November was Thanksgiving, and that was because of a rare occurrence: All four of my kids under the same roof! Three generations. L2R: Zach, Jenny, Paul (me), Gianna, Cailey, John, Karen, Dorothy, and Dominic.